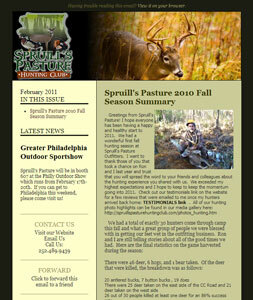 Email newsletter setup for Spruill’s Pasture, a cattle farm. The newsletter is meant to appeal to outdoorsmen that like to hunt and eat meat. The system allows them to easily login and edit the template to send out the next newsletter with updated text and images. The table of contents on the left side update automatically. In the admin side they can view the stats from each campaign, and see which links were clicked on the most and who clicked them. Email newsletters are a great way to cost effectively reach out to customers.